All covers and logos, including this one ©Marvel Characters, Inc. The fine new logo designed by Jim Steranko for issue 50 stayed unchanged for only 10 issues. During that time, the new creative team of Roy Thomas and Neal Adams began producing some of the best X-Men stories and art since Lee and Kirby left the book. For issue 60 a new version of Steranko’s logo was introduced, a redrawing to make it much less tall, though otherwise the same. This allowed more room for the cover art, and also room at the top for a tagline, so the reason is obvious. Some logos lose a lot of their impact when shortened like this, but the very tall letters Steranko designed actually work fine at this reduced height. In fact, the letters in MEN are now quite close to the proportions of the original X-Men logo. As to who made this version, it seems quite likely it was done on staff in the Marvel bullpen, but I’ve been unable to find out much about who was on staff then. It could have been Sol Brodsky, but it’s likely he wouldn’t have still been doing that sort of work, as Marvel continued to grow rapidly. Longtime staff letterer and cover paste-up man Danny Crespi would be a likely candidate, but I don’t know if he was on staff yet in 1969. Whoever did it understood the Steranko design and how the three-point perspective worked, and did a nice job with this version, which would remain on the covers for many years to come. The only real design change, and it’s minor, is that the X is a little further away from the hyphen. 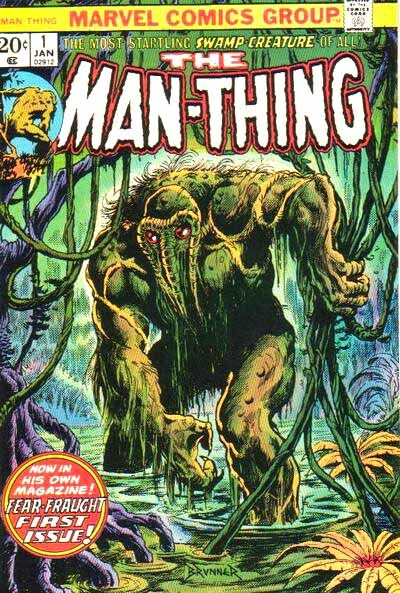 Creatively, hard as it is to understand today, the Thomas-Adams issues failed to raise lagging sales, and with issue 66 Marvel stopped producing new stories, and the title became essentially a reprint book for several years. 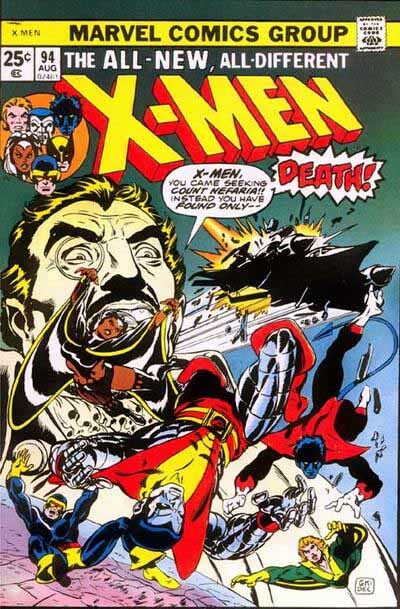 Those of you who have only known the X-Men as a wildly popular fan-favorite franchise, think back on these dark years, and know that, for X-Men fans of the early 1970s, things were very bleak indeed. At least the book remained on the stands, and eventually someone at Marvel decided it was time to try a new take on the title. But instead of launching that new take directly in the regular series, it began in an annual-sized square-bound book, part of a series of Giant-Size issues. 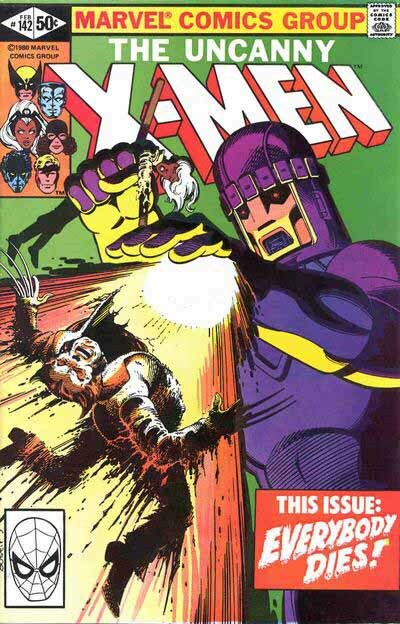 From this issue, the X-Men began a swift rise in popularity that has remained unbroken to this day, helped by some great new characters and deft handling of old ones. But we’re here to talk about the logo, and this one is quite a mess. First, we have the familiar GIANT-SIZE in vertical block letters, then a large X, also vertical, then a vertical hyphen and the word MEN slanted to the right. Everything has a similar drop shadow except the X, which for some reason has black telescoping with a single vanishing point centered below it. Again, this was probably done on staff, perhaps by Danny Crespi, though no one seems to know. 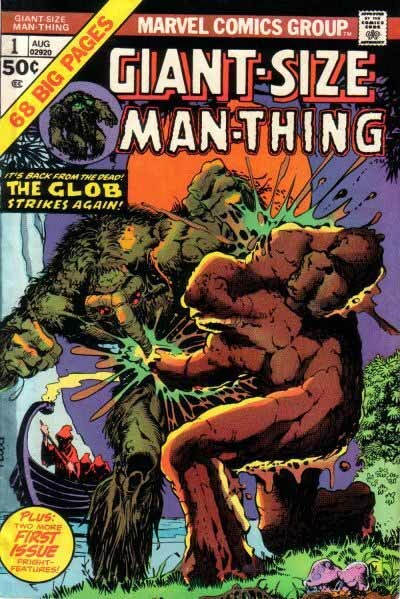 I asked Len Wein, and he had no idea, replying: “I had nothing to do with it or I would have had the ‘X’ italicized along with the rest of the logo.” Indeed. Well, they can’t all be winners. The logo doesn’t seem to have hurt sales, and was only seen once more, on issue 2, the last. 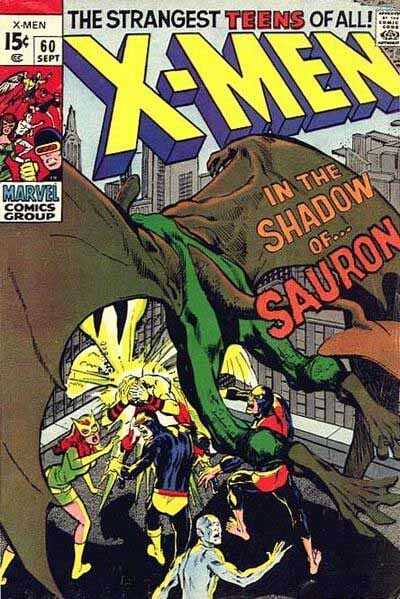 After that, the new team moved into the regular X-Men title, though with Chris Claremont taking over scripting from Len, and riding that horse hard in a celebrated decades-long run on the title. Here’s the first ALL-NEW issue, as the topline says. The revised version of the Steranko logo continued unchanged for many years, except for occasional revisions in the top line. With issue 142 that topline became part of the title. 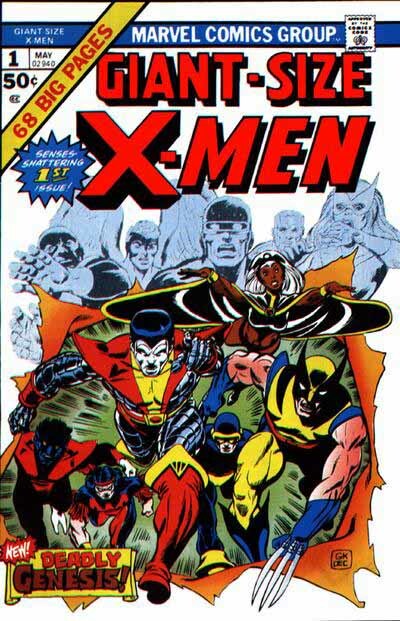 The UNCANNY X-Men, as it was now known in 1981, was in the middle of a terrific run by writer Chris Claremont, and artists John Byrne and Terry Austin. Sales were continuing to rise, and everything was rosy. In times like that, logos rarely change. Why meddle with success is the usual thinking. If anything, it was time to start expanding the X-Men into more titles, to see how far success could spread. And that’s what was about to start happening in 1982. More chapters and other logo studies on my LOGO LINKS page. This entry was posted in Logo Studies on October 2, 2007 by Todd. 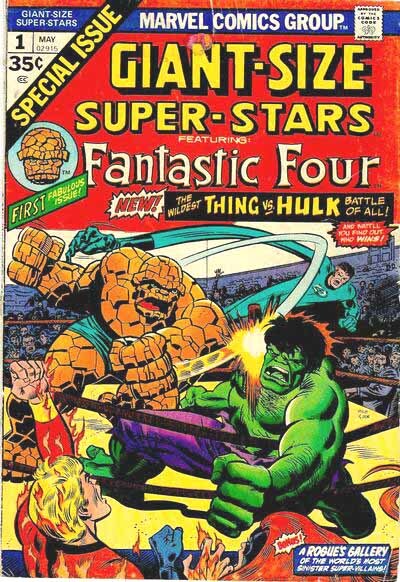 Giant-Size Super-Stars didn’t end there – they just removed the “Super-Stars Featuring” part of the title and made it “Giant-Size Fantastic Four” for the rest of the run. It’s similar to how Giant-Size Creatures was changed to Giant-Size Werewolf By Night, Giant-Size Chillers became Giant-Size Dracula, etc. Thanks, Michael. I knew I’d get something wrong with those Giant-Size books. A nightmare for listers, I’m sure, just like the DC Special Series ones that are all over the place in size and format. Todd – This is awesome that you’re doing this look at the X-Men logos and their effect. I love it! Lettering is far too underrated in comics for a business built on the combination of text and image. I’m loving all your logo studies. I honestly never gave logos much thought before, but that has certainly changed. Wonderful studies. Thanks. One little nitpick here: Issue #142 was not “the middle” of the Claremont/Byrne/Austin run, it was Byrne and Austin’s next-to-last issue. Early middle of Claremont’s first run, sure. Thanks, David. That’s what I get for not checking. FYI, according to the Official Marvel Index to the X-Men #3, published in 1987, it was Sam Rosen who redesigned Steranko’s logo for X-Men #60. Fascinating posts! Can’t wait to read more …. Thanks for the information, Tom. It certainly could have been him. I wish I knew the source of the information in that “Official” book, though. First of all, your Logo Studies are GREAT! I, of all people, realize that Logos are the second-most important thing on a cover, after the artwork, when it comes to interest a possible future customer in sampling your books, and it’s good to see that you constantly point that out. Now let’s hope that the comic book professionals take that to heart, so that we may get future classics of the same quality level as Sixties and Seventies Logo Legends like “Superman”, “Batman”, “Justice League of America”, “Superboy”, “Warlock”, “The Mighty Thor”, etc. I will keep your request in mind for the future, thanks for the suggestion. I loved that book too.